Wednesday’s ad is for Guinness, from 1965. While the best known Guinness ads were undoubtedly the ones created by John Gilroy, Guinness had other creative ads throughout the same period and afterward, too, which are often overlooked. 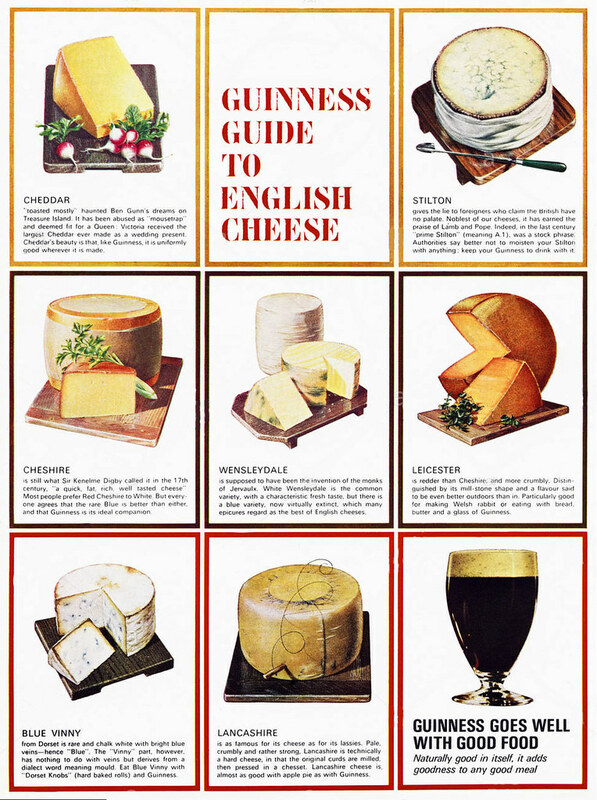 In this ad, the “Guinness Guide to English Cheese,” seven different English cheeses are illustrated, each with a short description about them, and what foods to pair with them, not to mention how good a glass of Guinness will pair with each cheese. Friday’s ad is for Guinness, from 1951. While the best known Guinness ads were undoubtedly the ones created by John Gilroy, Guinness had other creative ads throughout the same period and afterward, too, which are often overlooked. 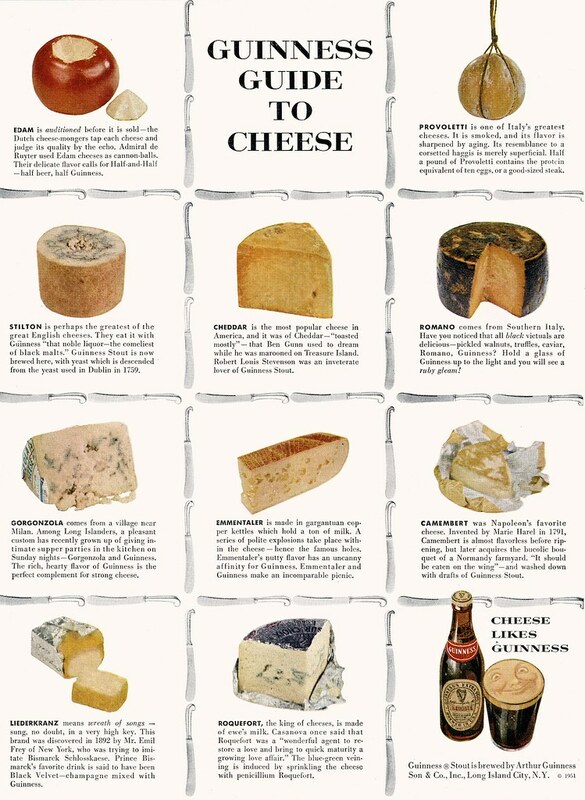 In this ad, the “Guinness Guide to Cheese,” ten different types of cheese are illustrated, each with a short description of how they taste, and what other foods to pair with them, not to mention how good a glass of Guinness will pair with each cheese. Today’s infographic, entitled Surprisingly Delicious Duos shows ten beer and cheese pairing suggestions, though I don’t know its origin or who made the pairings. Today’s infographic is a chart for pairing cheese with beer, and other alcohol, put together by Artisanal Premium Cheese, with four basic kinds of cheese and some general suggestions. Offhand, their suggestions actually aren’t that sound. If there’s anything I’ve learned about pairing cheese and beer, it’s that you can’t really make generalities. They also have a plate and pairings page that attempts to provide more information, but even that seems woefully simplistic. 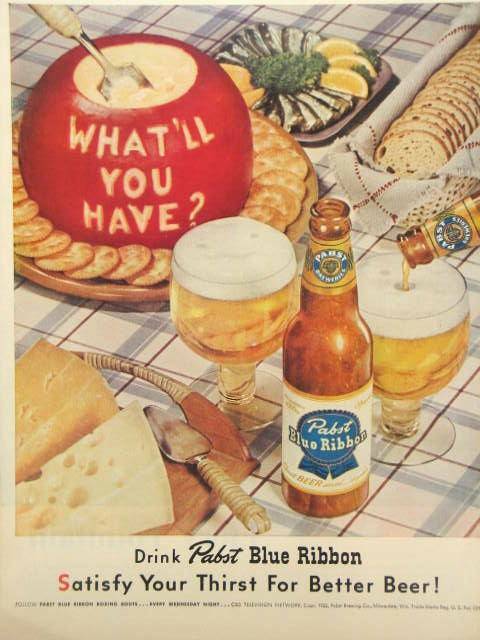 But at least they’re acknowledging that beer and cheese can be paired. Click here to see the chart full time. 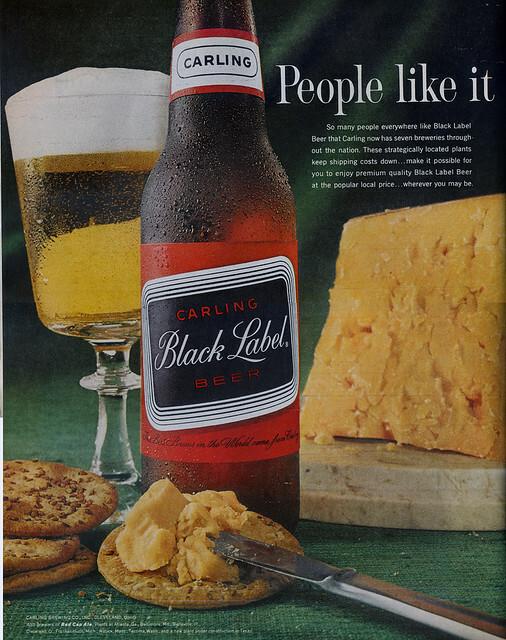 Thursday’s ad is for Carling Black Label, from 1953. It’s from their “People Like It” series, and features a big hunk of cheese to pair with your beer. Even back then they knew that cheese and beer is a divine pairing, though I have to wonder if that’s the right beer for that cheese. Everything old is new again. This should be a great event. 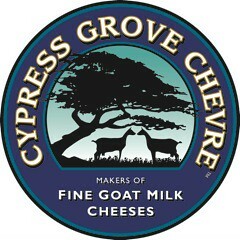 Sean Paxton, the Homebrew Chef, has teamed up with Point Reyes Cheese for an amazing day of cheese and beer. 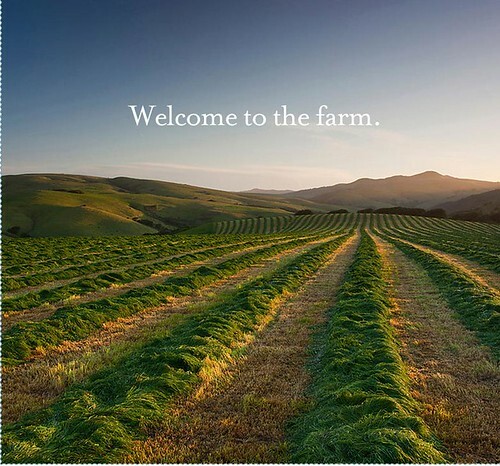 On Saturday, December 8th from 10:30 am to 3:00 pm, Sean will be at the Point Reyes Farmstead Cheese Company, makers of the wonderful Point Reyes Blue, among others. The day will include “an educational walking farm tour, focused cheese tasting and a demonstration class led by Home Brew Chef, Sean Paxton. This special day will include a craft-beer-inspired and paired 4-course lunch. 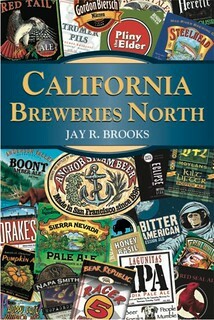 This educational experience is definitely for beer and food lovers!” It would also make a great early Christmas present, too. Wouldn’t you rather be drinking beer, eating cheese and taking in the beauty of nature than fighting the Christmas shopping crowds? Tickets can be purchased online and are $120 per person. That includes everything; a Walking Farm Tour, Focused Cheese Tasting, and the Four Course Cooking Demonstration with Lunch & Craft Beer Pairings by Sean Paxton over four and a half hours. 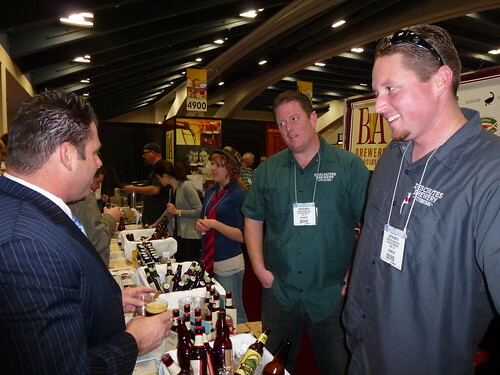 For the third straight year, beer had a bigger presence at the Winter Fancy Food Show, held each January in San Francisco. The Brewers Association once again had a booth pouring beer from a variety of craft brewers, through their Export Development Program (EDP). I went the first year, too, and this year it again appeared to be one of the most popular booths at the giant food show that features high-end, specialty foods. Hopefully not by coincidence, the BA’s craft beer booth was located next to most of the cheese, which made finding divine pairings quite easy. There are few things better than great beer and cheese together. In talking with Bob Pease, COO of the BA and head of EDP, it was clear this was the right crowd to help build craft beer. Attendees were by and large retailers who carry not just ordinary grocery fare, but high-end, specialty foods. Craft beer, of course, is a high-end, specialty food and these days, any specialty food retailer carrying better cheese, bread, chocolate, charcuterie, etc. but not craft beer, is missing out. And many people there seemed to understand that. People lined up to try the beers, and unlike your average beer festival, most asked good questions not just about the beer, but what foods it went with, how to market it, etc. 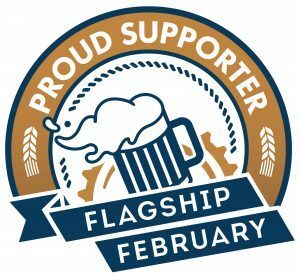 In several conversations I eavesdropped on, retailers admitted not knowing much about craft beer, but seemed to understand it was now part of the specialty food world and were eager to learn more and understand how it could fit into their own businesses. 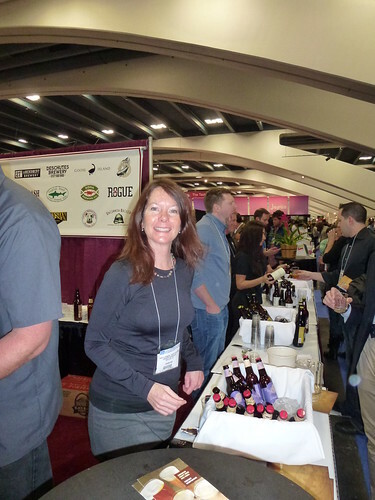 Nancy Johnson, Event Director for the BA, sampling people on Dogfish Head’s beer. 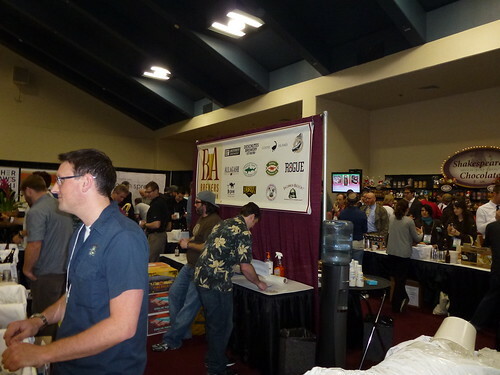 Having had most of the beers from the dozen breweries at the BA’s booth, I wanted to see what else was being featured at the show, so I spent a few hours walking the aisles and stuffing my face with countless delicious samples being offered at nearly every booth. I was in heaven with all the different cheese available for sampling. I must have eaten at least a pound or more of cheese in the aggregate. 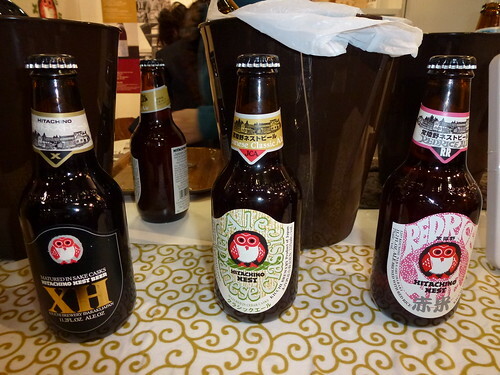 There was an entire area devoted to Japan’s cuisine, and among those booths I discovered that Hitachino Nest Beer was sampling people on three of their beers. 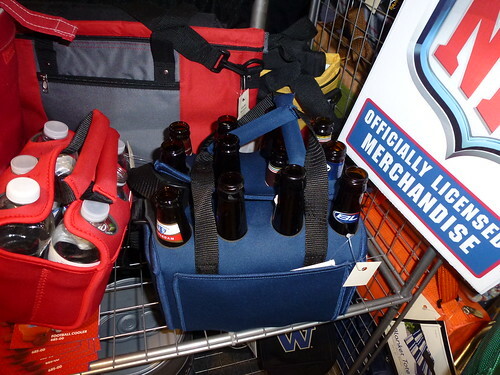 I also noticed this clever carrying-case to transport a twelve-pack to your next tasting. 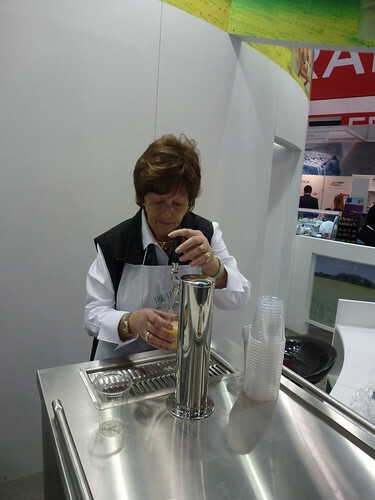 Not surprisingly, they were also pouring beer — Spaten — in the German cuisine area. 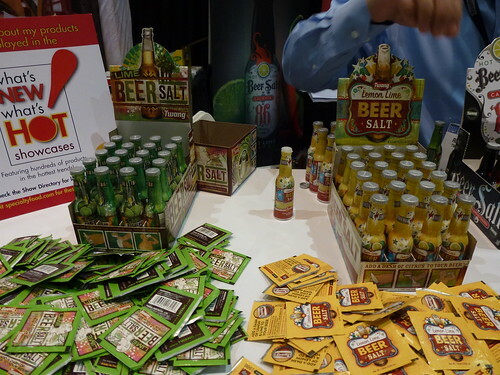 And last, though in this case possibly least, there was also a booth featuring beer salt. Though I suppose if you’re stuck drinking Corona, with a wedge of lime and some beer salt, you’d have the makings of a beer margarita. Anyway, the Fancy Food Show was great fun, and it was amazing to see so many innovative foods, and the way they were being presented. There was food from a dizzying number of countries, and many new ways of eating more traditional fare. But what was really terrific to witness, is how many people were so accepting of beer as a part of the great panoply of food. I don’t so much like the word “fancy” as a way of describing either craft beer or most of the foods at the show, and I suspect that’s a name with a history that they’re somewhat stuck with now. The Fancy Food Show is put on by the National Association for the Specialty Food Trade, and that’s a much better way of looking at it. Because none of the food there could be considered ordinary, it was all pretty special. And that’s one way to look at beer, too. There’s ordinary beer — well-made but fairly bland without much flavor — and then there’s craft beer — loaded with flavor and in endless variety. Give me the specialty beer every time. Life’s just too short to settle for the ordinary. I’ll be very much surprised if there’s a great turnout for Session #51.5. It is after all, asking a lot — and for a second time in two weeks — gather together a selection of beers and cheese. For this extra Session, the instructions were in the round-up for Session #51. The idea was to use the list of beers chosen by everybody for each of the three cheeses that were listed in the round-up to try a few more beers with the same cheese. 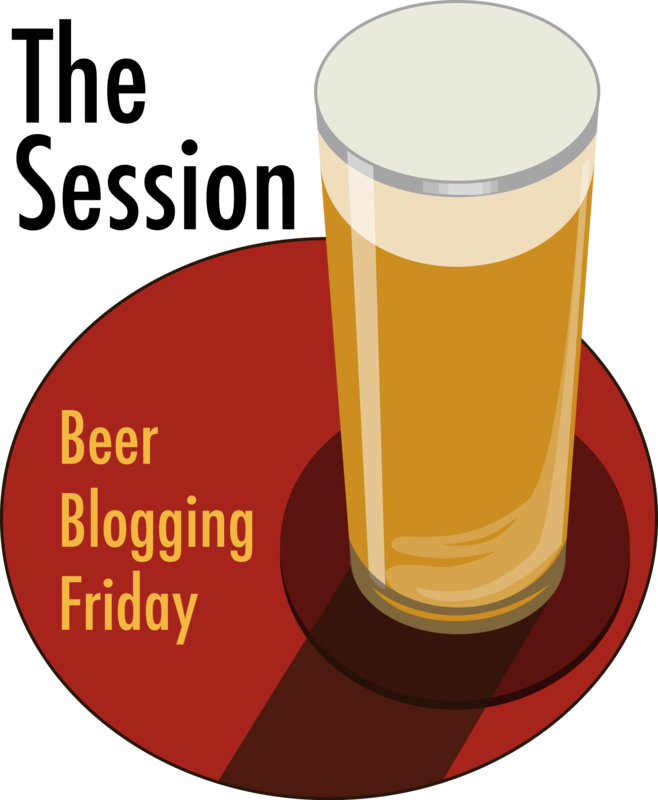 Simply pick up some of the other beers that were suggested, and try them with the same three cheeses and do a follow up blog post on or around Friday, May 20 to explore more fully pairing cheese and beer. 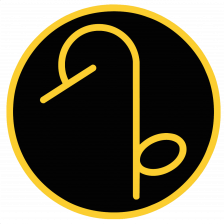 You can write about how your choices compared, or what you learned from the other suggestions, or which out of all the ones you tried worked best. What recommended pairing most surprised you? Which didn’t seem to work at all, for you? It’s my way of taking the Session concept and making it more interactive and collaborative, essentially an “online cheese-off.” First, we made our best recommendations for pairing a beer with these three cheeses, and now we have an opportunity to try as many of the suggestions as we can, and discover which worked best. I’ll then do a second round-up and report the findings of the group as a whole to the beers and the three cheeses together. If you’ve already done Part One, don’t stop now, keep going. Read what your fellow bloggers liked, and pick a few to try yourself. To participate, just post a comment here or at the round-up with a link to your blog post for Session #51.5. A final note. Since it’s not really an “official” Session, don’t worry too much about sticking to today’s date. 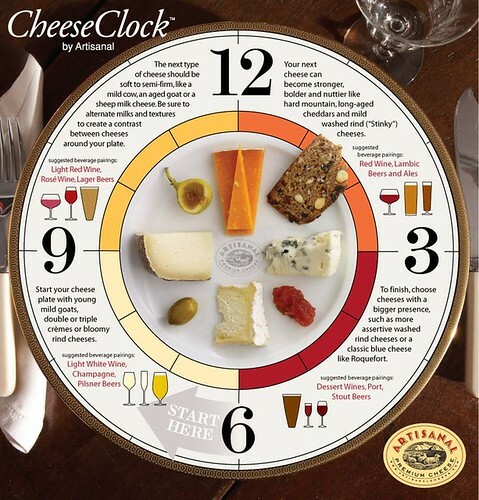 Have another cheese tasting whenever you like, whenever it’s convenient or you feel like it. To be honest, after being in South America for the last eleven days, I’m too tired to do it today myself, and will most likely do it next week. Feel free to do likewise. I’ll keep adding posts as they come in. Also, don’t forget about Session #52, coming up Friday, June 3. Well that was great fun, I was certainly glad to see so many people step up and participate, despite my best efforts to make things as difficult as possible. And everybody seemed to have a very good time, too. Cheese and beers just brings out the best in all of us, I guess. Anyway, I’m doing the round-up a little bit differently this Session, because this is not just the end of the Session, but also the beginning of the second phase, or Session #51.5. 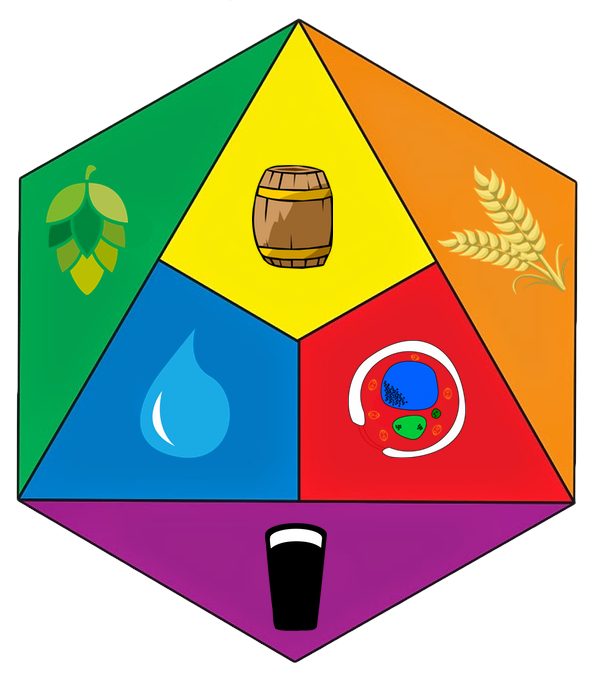 Below you’ll find a list of all of the beers paired with each of the three cheeses, or their substitute parenthetically, along with a link to each Session post submission. In most cases, I listed just the best pairing from each blogger for each cheese, unless otherwise noted. Also, I’ll continue to update this list as late submissions continue to roll in, as they inevitably do. Following that, you’ll find instructions on how to participate in round two, Session #51.5 on Friday, May 20. 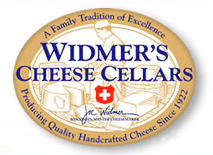 Here are the best pairings everybody chose for the Widmer 1-Year Aged Cheddar, or a suitable substitute. I’ve noted what substitute cheese was used, where applicable. Here are the best pairings everybody chose for the Humboldt Fog, or a suitable substitute. I’ve noted what substitute cheese was used, where applicable. Here are the best pairings everybody chose for the Maytag Blue, or a suitable substitute. I’ve noted what substitute cheese was used, where applicable. 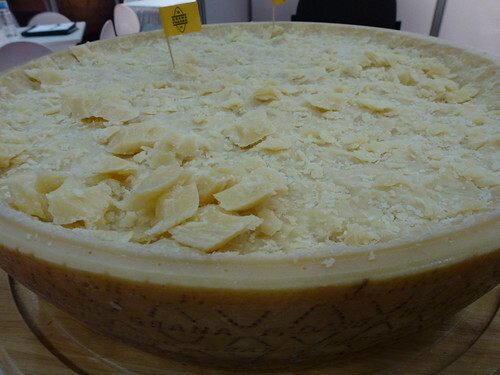 I was also glad to see so many people not stress too much about the specific cheeses I recommended. I knew that not everybody would be able to find them going in, but it seemed like the more who could find the same cheeses, the better the experiment would work, because it could more easily be duplicated regardless of location. 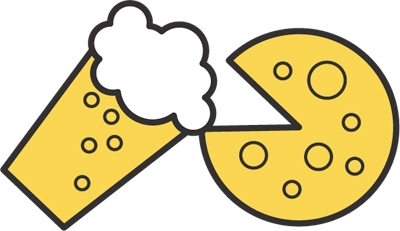 But I also realized that with beer bloggers so spread out around the world, that in the end it was an impossible task and felt it was better to participate with a substitute cheese then not at all, and as long as the cheeses were somewhat similar, I figured it would still be valid. A number of people also added additional cheeses or could not find substitutions that were similar, so the list below is all of the other and extra cheeses that peoples paired together. Okay, I know not everyone will want to go for this, but if you’re with me so far and you’ve already participated in Session #51, here’s the idea for part two. Use the list of beers chosen by everybody for each of the three cheeses that are listed above to try a few more beers with the same cheese. Over the next two weeks, simply pick up some of the other beers that were suggested, and try them with the same three cheeses and do a follow up blog post on Friday, May 20 — which I’m calling Session #51.5 — to explore more fully pairing cheese and beer. You can write about how your choices compared, or what you learned from the other suggestions, or which out of all the ones you tried worked best. What recommended pairing most surprised you? Which didn’t seem to work at all, for you? It’s my way of taking the Session concept and making it more interactive and collaborative, essentially an “online cheese-off.” First, we made our best recommendations for pairing a beer with these three cheeses, and now we have an opportunity to try as many of the suggestions as we can, and discover which worked best. I’ll then do a second round-up and report the findings of the group as a whole to the beers and the three cheeses together. Spread the cheese .. er, the word. If you’ve already done Part One, don’t stop now, keep going. Read what your fellow bloggers liked, and pick a few to try yourself. To participate, just post a comment here with a link to your blog post for Session #51.5.